As European Union ministers prepare to gather in Riga on Monday for meetings on Health and Consumer Affairs, including a discussion of EU alcohol policy, Matilde Poggi (above, president of the Italian Federation of Independent Grape Growers [FIVI]) has previewed a brief she plans to send to send to Italian health minister Beatrice Lorenzin. 1) Paraphrasing Poggi’s brief, the author of the post writes that restrictions on interstate sale of alcohol would counter current agreements between member states. 2) In a document published by the European Commission’s Committee on National Alcohol Policy and Action, there is a proposal for minimum pricing requirements for wine. Minimum pricing regulation would give large producers of commercial wine an unfair advantage, the author writes. The “Informal Meeting of the Ministers for Employment, Social Policy, Health and Consumer Affairs” is to be held in Riga next week because Latvia currently holds the EU presidency (the author of the Slowine post reports erroneously that the gathering is to be held in Lithuania and that Lithuania is the current EU president). As EU policy on alcohol and Common Market Organization regulation (known as OCM in Italy) continue to evolve, there are growing concerns among Italian winemakers that European wine culture will be stifled by over-regulation and disregard for local tradition. 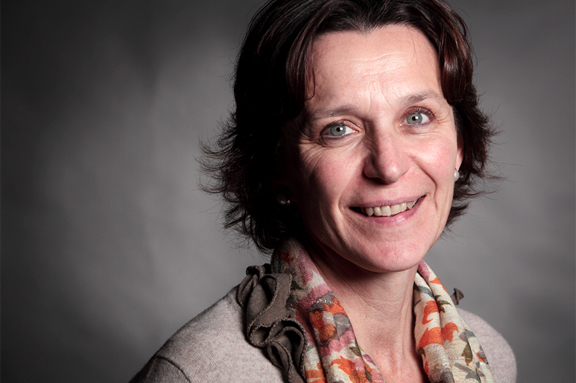 Poggi, who was recently elected as the vicepresident of the Confédération européenne des vignerons indépendants (European Confederation of Independent Grape Growers [CEVI]), has taken an active role in voicing concerns of independent grape farmers and winemakers. She has served as the president of FIVI since 2013. 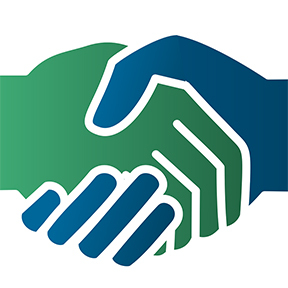 Click here for the Committee on National Alcohol Policy and Action’s “scooping paper” and its recommendations. Image via FIVI. It would be too easy to simply post a panegyric on Valter Fissore’s extraordinary expressions of Barolo. I was blown away by the focus and elegance of the wines he showed at the fair this year. 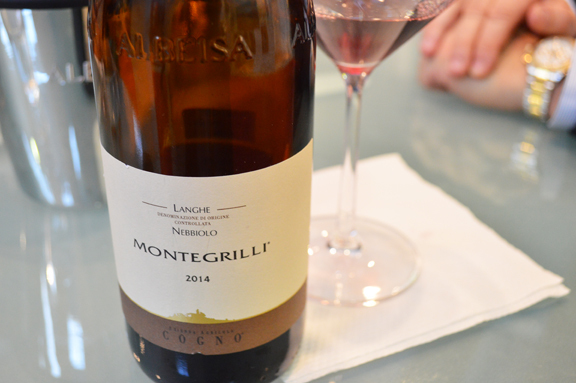 But the wine I can’t stop thinking about is the 2014 Elvio Cogno Langhe Nebbiolo Montegrilli. Even in a challenging vintage, this wine delivered on every level. Great Nebbiolo with wonderful freshness and transparent fruit. I loved this wine. In the days that led up to the fair, there was a lot of talk about the Veglio family and their Cascina Bruni’s new partnership with famed Italian enologist Riccardo Cotarella. Offline, a lot of people wondered if this meant a new “modern” approach to the wines (because Cotarella is known for his love of modernity in winemaking). I was stoked to sit down with Cristiano Veglio and taste through the wines: the old school style hasn’t changed at all. The family has merely used Cotarella’s consulting to improve vineyard management and winemaking practices, he told me. 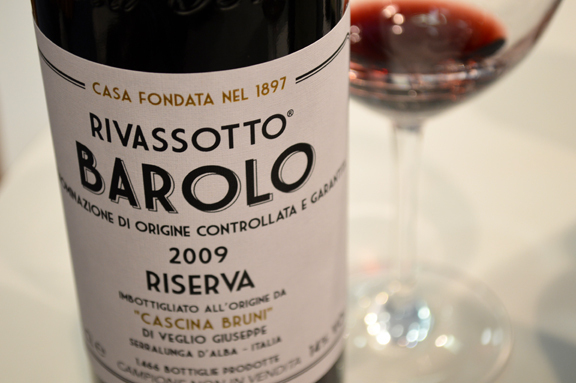 I really liked the 2009 Barolo Rivasotto, which is already starting to show nicely despite its youth. The 2010 vintage in Brunello has received so much media attention, said Laura Brunelli, one of my favorite Montalcino producers, that she’s already sold-out of her wine. A lot of people told me that actually. It’s always great to sell wine, she noted, but she fears that the 2010 will eclipse other solid vintages like the 2011. The cask sample she shared was gorgeous. I really liked Barbi’s Brunello 2009, which showed beautifully in the flight that they poured for me. The warm temperatures of that harvest made it a challenging vintage for many growers but Barbi delivered a great wine from that crop. 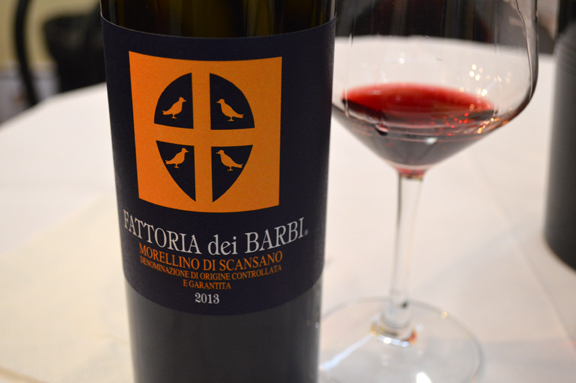 But my discovery wine from Barbi was its 2013 Morellino di Scansano. The 2013 vintage is going to be such a great one for Brunello and Tuscany (and many other regions and appellations, as well). I loved the meatiness and texture of this wine and its fantastic, electric Sangiovese character. A great wine to pair with a piece of charred beef. Another discovery was the Palazzo Vecchio Vino Nobile di Montepulciano. This youthful winery has the growing sites and the know-now to deliver vibrant, traditional-style expressions of Sangiovese. So much crappy wine comes out of Montepulciano these days, which is sad because even I am old enough to remember when Montepulciano produced a lot of solid wine. It was great to chat with them — however briefly — and taste these stellar wines. Welcome, new Mohicans! Anyone who’s ever been to Vinitaly knows that the better winemakers always have something great to nosh on. My friend and client Silvano Brescianini turned me on to a new — yes, new! 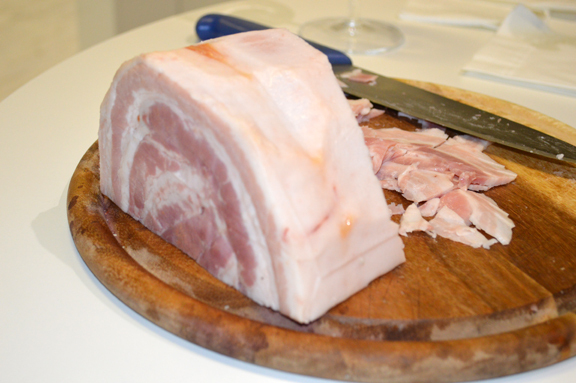 — category from Emilian prosciuttoland: it’s a pancetta that’s cured like a prosciutto cotto. It’s called “Giovanna” by the producer Capitelli (here’s the fact sheet; in Italian). Please stay tuned for my sparkling tasting notes next week. Thanks for being here! Taste with me next week in… MEXICO CITY! Long before I ever dreamed of traveling to Italy to study, Mexico was a refuge from the trappings of my American dream. I grew up in San Diego, California. Baja California (or “Baja” as it was known to me in my youth) and Tijuana were only a thirty-minute drive from our home. It was the time of the devalued peso, when many believed that revolution was coming to the country. As a result, many affluent citizens resettled in Tijuana and San Diego. And with them came some extraordinary restaurants on the Mexican side of the border, including the legendary Puerta del Sol. During those years — my teenage years — my family life was in turmoil. It wasn’t an easy time for an adolescent. Luckily, the year I turned 16, the family of some of my Mexican friends offered to take me to Mexico City for the summer. “La Ciudad” changed my life forever. Xochimilco, the Plaza Garibaldi, and the many culinary adventures of that summer opened my eyes and cast my gaze far beyond the gilded prison — at least it felt like that to me — of La Jolla. And so I was thrilled when my client Barone Pizzini asked me to pour their Tre Bicchieri-winning wine at the Gambero Rosso Tre Bicchieri World Tour tasting on Thursday, April 23. If you happen to be in Mexico City next week, please let me know. And if you have any recommendations on where to eat, I’d greatly appreciate your insights. Please just shoot me an email and/or leave a comment below. Nos vemos la semana próxima en la ciudad de México! In a world where wine is becoming increasingly demotic, we lovers of the “new old” need to remember to be fair and gentle with our fellows. Last week, I inadvertently accepted an invitation to a preview of an outdoor weekend “wine fest” here in Houston. I won’t go into the details but by the time I realized what kind of wines were being poured, it was too late to decline politely. 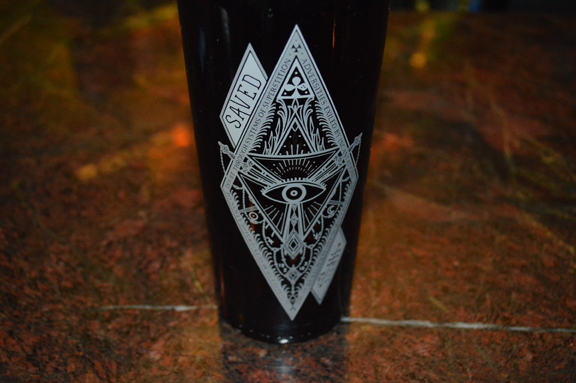 The centerpiece wine in the tasting was a California red blend by a legacy Napa grape grower and winemaker and a celebrity tattoo artist. A robust, powerful wine with a big personality and a generous finish. It is big, bold and rich, with pedigree sourcing from California’s finest regions. An eclectic blend of grapes deliver rich color and full-bodied flavors: red currant, black cherry and black olive. Soft tannins balance well with distinct oak flavors – French oak for vanilla and coconut; American oak for caramel, créme brûlée and coffee. [The wine is made using] 31% Zinfandel, 23% Carignane, 12% Petite Sirah, 11% Malbec, 10% Merlot, 9% Petit Verdot, 2% Mixed Blacks, 1% Ruby Cabernet, 1% Syrah. But the fact is that the “big” California style still enjoys an immense and intensely loyal following throughout the United States. 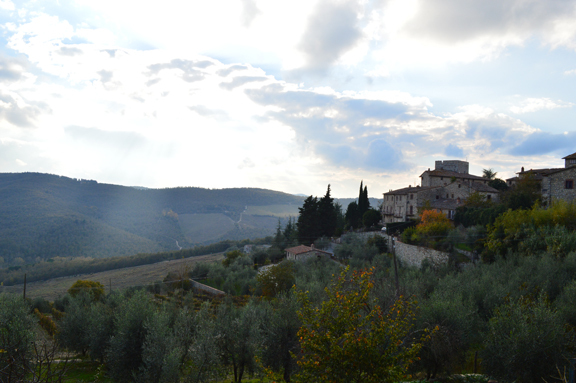 Above: the village of Vertine in the heart of Chianti Classico. I’ve spent the better part of my day reading up on all the literature devoted to the origins of the place name Chianti. Chianti is what is known in toponomastics (the study of place names) as a choronym (Greek for chorus name), in other words, a place name that refers to a number of different places in the same general area. In the early twentieth century, two theories as to its origins emerged. On the one hand, scholars have speculated that it came from the Etruscan clante or clanti (the Etruscans were the ancient people who inhabited Italy before the rise of the Roman Empire). 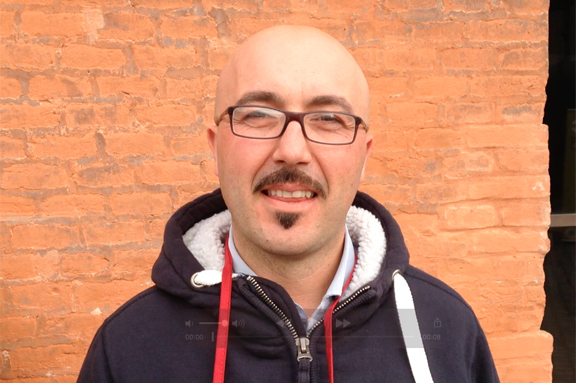 Above: who better to “speak” Zibibbo and Grillo than winemaker and grape grower Antonino Barraco? He and I connected at the Vini Veri fair last month in Cerea (Verona province). Here’s the latest installment of the Italian Grape Name and Appellation Pronunciation Project: Grillo and Zibibbo as pronounced by Antonino Barraco (a super cool dude, whom I met for the first time this year at Vini Veri). While the pronunciation of Grillo (GREEL-loh) is relatively straightforward, the scansion of Zibibbo is not as intuitive as some may think. In Italian grammar, words that come from Arabic (like Zibibbo) are pronounced with a stress on the first syllable — even when there is a stress on the syllable that follows. Zibibbo, which comes from the Arabic zabib, is an example of this. Note how Antonino gives equal stress to the first and second syllable in his scansion. Zabib means dried grape or raisin in Arabic. And it’s one of the many words that found their way into Sicilian during the height of Arabic culture in the Middle Ages, when, for example, Arabic mathematicians and philosophers were welcomed at the court of Holy Roman Emperor Frederick II in Palermo. As a bonus track, I’ve included Antonino’s pronunciation of zbib, the Sicilian dialectal inflection of zabib. 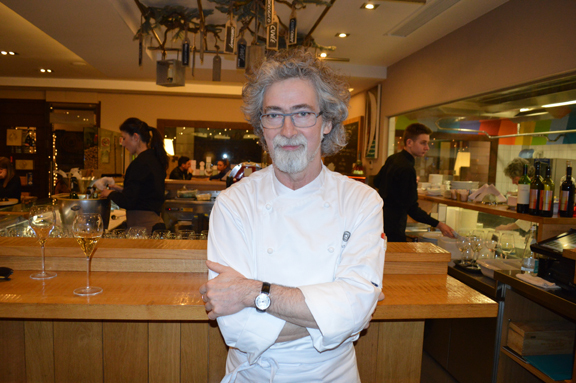 It felt like the end of an era: when Giovanni, Arianna, and I connected at the Dispensa Pani e Vini in the heart of Franciacorta on my second night in Italy last month, we were all a little blue because we knew that it was one of Vittorio Fusari’s last nights in the kitchen there. I ate at the Dispensa for the first time not long after it opened in 2008. It was the same day that I met Giovanni for the first time. He would become one of my best friends and the accomplice in many of my capers. In 2013, when Tracie P was pregnant with Lila Jane, she, Georgia, and I ate at the Dispensa three times in the course of 36 hours (although one of those meals was a to-go repast shared in our hotel). THAT’s how much I love this restaurant and Vittorio’s cooking. A few days before I arrived in Italy last month, Vittorio had announced that he had accepted a position as executive chef at the Michelin-starred Pont de Ferr in Milano. It’s going to be hard on Franciacorta, too. I wrote about our conversation and what it will mean for Franciacorta today for the Franciacorta, the Real Story blog. I’ll be heading back to Franciacorta in a few weeks and I’ll visit the Dispensa for sure. After all, it’s the ideal location for Franciacorta visitors and franciacortini to congregate over a glass of sparkling wine. And I’m sure that the kitchen and verve of Vittorio’s cooking will continue to thrive there even as he oversees his staff from a distance. 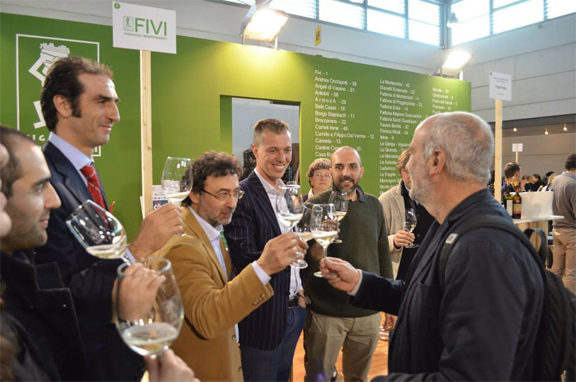 Above: venerated Italian wine writer, blogger, and winery consultant Maurizio Gily (right) was toasted by members of the Italian Federation of Independent Grape Growers at Vinitaly last month. In the days leading up to Vinitaly, Italy’s annual wine trade fair Verona, Maurizio Gily — one of the country’s most respected wine writers — announced that an appeals court had overturned a December 2013 ruling that required him to pay a €5,000 fine in a defamation suit brought against him. The case stretches back to Vinitaly 2008, when Espresso contributor Paolo Tessardi published his sensationalist feature on “Velenitaly” or “poisoned Italy” (a play on Vinitaly). In it, he implicitly admonished Italian wine lovers to avoid consumption of Italian wines. And he implied that many commercially produced Italian wines contained life-threatening toxins. Not long after, Gily — one of the country’s most respected wine writers — published a blog post on his Mille Vigne blog in which he contested Tessardi’s claims. Ultimately, none of Tessardi’s claims proved to be true. In the judge’s ruling in 2013, he noted that although Gily’s facts were correct, he had damaged Tessardi’s reputation. 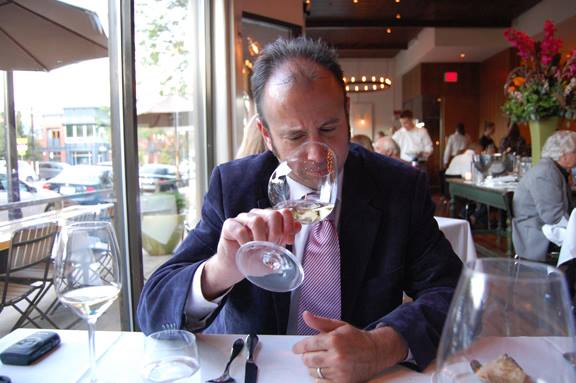 Gily ascribed the urgency and vehemence of his blog post (subsequently removed) to the fact that Tessardi’s inaccurate reporting caused inestimable damage to consumers’ perceptions of Italian wine. Tessardi only discovered Gily’s post three years after its publication (thanks to an internet search). And he filed his complaint against Gily in the wake of his discovery, long after any memory of the Velenitaly story or Gily’s editorial had faded from public discourse. After the initial ruling had been handed down — I remember well — Gily wondered if it would be easier to simply pay the fine and move on. Instead, he decided to crowd-fund the financial resources needed to fight the judgement. Ultimately, he raised €15,000. Maurizio, thank you for standing up for all of us. Thank you for standing up for Italian wine! 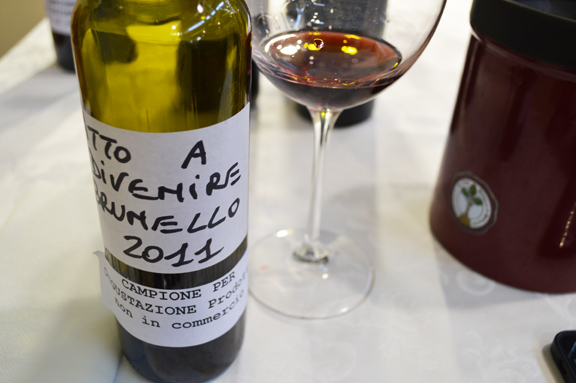 Today’s post is just the first — and perhaps the most urgent — in my Vinitaly 2015 highlights. Stay tuned for my top tastes and other juicy nuggets! 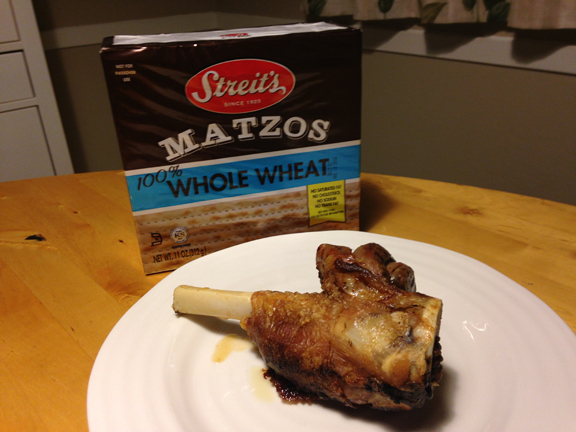 I thought of her post early this morning, Texas time, when I got up before the girls so that I could roast a beef shank for our Passover seder tomorrow night. Of course, I didn’t get to meet the cow whose shank I bought yesterday at a local market. And we’re going to be having Jewish-style brisket for our main course tomorrow night: the shank serves solely as a symbolic component — the centerpiece — of our seder plate. 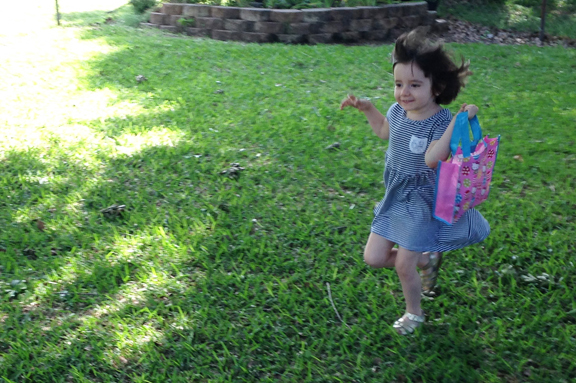 But her note and my own “sacrificial lamb” remind me of how the Passover, Easter, and the renewal and rebirth of spring are ancient traditions that bind us together in our humanity. This year, Erev Pesach (the first night of the Passover) falls on Good Friday. The confluence reminds us that Easter has its roots in the Passover (most agree that Jesus’ “Last Supper” was a Passover celebration). And Passover — as Jewish scholars widely acknowledge — has its roots in ancient pagan celebrations of spring. In the Passover legend, the z’roa is a symbol of the Pesach sacrifice, a lamb that was offered by the ancient Jews in the Temple of Jerusalem on the first night the Passover festival. But the expiatory sacrifice of a lamb in springtime dates back to the Romans and beyond. Just think of it: in a time before monotheism, the arrival of spring and warmer temperatures and the renewal of the vegetative cycle were gifts from the gods. It’s not hard to imagine why they were inspired to slaughter a lamb as an offering. Here at the Parzen household, we’ll be celebrating the Passover tomorrow night with my mother, who’s flying in for the holiday. 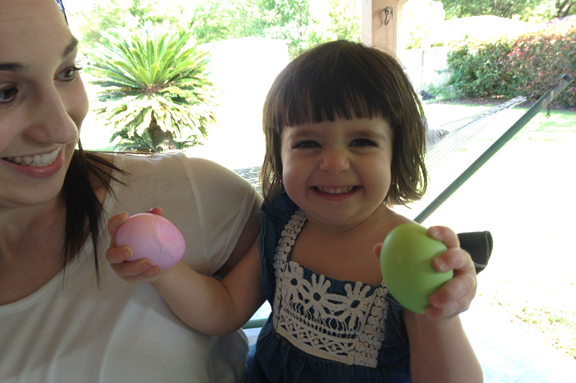 And then we’ll be heading to Orange in East Texas to paint Easter eggs and celebrate the holiday with Tracie P’s family. I’ll be taking a break from the blog and from work until next week as I reconnect with family and recharge my spirits: it’s a time for renewal and rebirth. O and we’ll be pairing 2013 Cirelli Montepulciano d’Abruzzo with our brisket tomorrow night.